Creativity exists in virtually all domains of life while art is a particularly good example of human creativity. Creativity refers to the ability to produce work that is both novel and original . Previous works investigated the cognitive processes involved in creativity rather than solely the influence of personality traits or social environments . Patients with dementia with different artistic abilities have allowed for investigations into different functional anatomies necessary for artistic behavior [3,4]. Specific creativity in art is studied from established artists having brain lesions or in patients who show artistic talent after the brain damage (i.e. de novo case). Current explanation of creative achievement emphasizes the role of right hemisphere [5,6] but the production of art requires complex holistic combination of sensory, cognition and motor activities. For new ideas to originate, the entire temporal-parietal-occipital network of associative  and semantic knowledge needs to be in an intact state. It has been proposed that the left inferior parietal lobe is involved in categorical apprehension  and technical reasoning about the mechanical properties of tools and objects [9,10]. A link between hypofrontality and creative thought has been proposed [11-13]. The participations of prefrontal lobes are required to integrate information and to enable still higher cognitive activities such as abstract thinking, planning, theory of mind [14-16] and goaldirected attention . Literature from individuals with degenerative brain lesions has helped to map out the regions of artistic abilities and creativity, of which patients that exhibit artistic behavior following semantic dementia (SD) or frontotemporal lobar degeneration (FTLD) were reported [4,18]. SD is considered as one of the variant in primary progressive aphasia  while the core features include impaired confrontation naming and impaired singleword comprehension. In contrast with other degenerative aphasia syndrome, SD patients had a spare of repetition, grammar and motor speech abilities. We are going to present a non-artist patient who developed passion and compulsion for painting after the degenerative processes of SD. 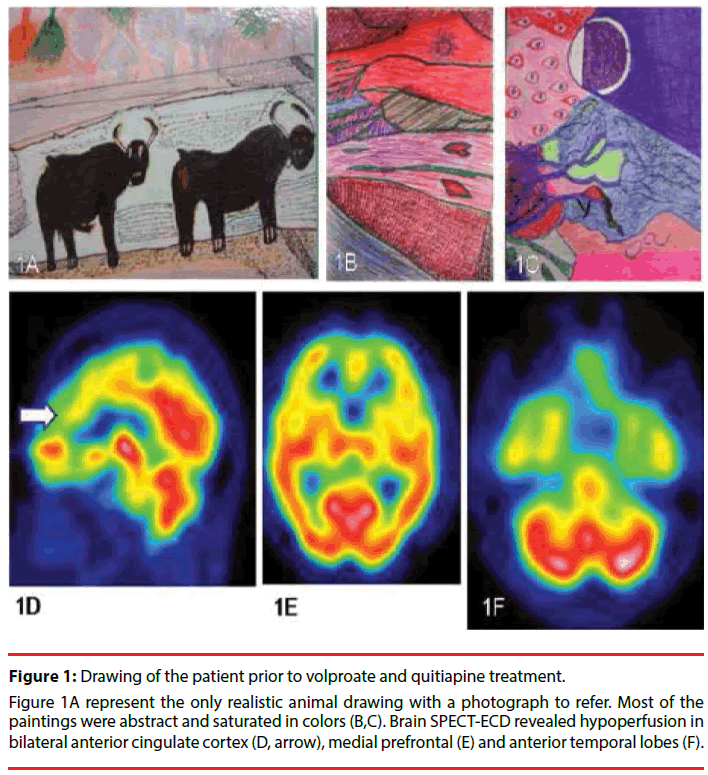 Changing of behavior and painting styles were observed by the clinician before and after using quetiapine and valproate acid. We arranged two brain single photon emission computer tomography (SPECT) studies to analyze the changes of intracerebral perfusion patterns before and after the treatment. From the SPECT results, we discussed the possible mechanisms linking the prefrontal and temporal-parietal networks to the changing styles of paintings. A 74 year-old right-handed gentleman who had no formal education had been referred to the memory clinic for insomnia, restlessness and behavioral changes that had evolved over the past six months. He described an interest in gardening and collecting pictures that began during his late fifties. Six months prior to evaluation he began to have frequent arguments with his wife. Grandiose delusions emerged and the patient believed that he was an emperor from heaven descending on the world to taste human suffering. He navigated well and rode motorcycles to the market for food and groceries. The family noticed a dramatic personality change. Remarkably, his daughter noticed that he had gained new artistic abilities. He started composing songs with Taiwanese lyrics. The words in the songs obeyed linguistic rules requiring syllables at the end of each lines (Fei-kin, Bu-Chin; Hagae, Bwan-gie) but the meanings were irrelevant (heavy, not clear; learn skills, thousands of ways). He stole his grandson’s color pen for drawing. He became visually compulsive and copied whatever Chinese character he saw. During the interview, he had pressured speech and jumped from topic to topic. He complained of difficulty with focusing upon his painting. He was easily distracted by the surrounding sounds and he frequently interrupted others’ conversations. Although he scored 26 in the mini-mental status examination , neuropsychological testing revealed low semantic verbal fluency (one animal in one minute). He repeated six digits forwards and two digits backward. Rey- Osterrieth complex figure copy (Boone 2000) was 15 out of 17 (reference: 15.8 +/- 2.1). In 15 items selected from Boston naming test , he scored 8 (reference range as 14.8 +/- 1.7). On the Cognition Assessment Screening Instrument , he scored 66.8 which was around 50 percentile of the age and education. The maximal impairment was abstract thinking (5 out of 12), mental manipulation (4 out of 10) and verbal fluency scores (1 out of 10; Reference as Ã¢ÂÂ§6). Neuropsychiatric Inventory  revealed sleep disturbance, emotional liability, agitation, eating behavior and disinhibition. Brain magnetic resonance imaging revealed atrophy in bilateral frontal and anterior temporal regions. SD  was diagnosed. Quetiapine at 25 mg QHS and valproate 600mg per day were started for behavior and mood stabilization. After seven days the sleep pattern and behavior improved but not in semantic functioning. He still scored 8 in 15 items Boston naming test  with low verbal fluency (two animals in one minute). He began to inquire regarding the well-being of his daughter and wife, talked less and paused for others to respond. Unfortunately, his singing ceased and he stated that it was embarrassing to sing in front of others. The new melodies that previously came to him disappeared. Yet, over two days, he completed more than 30 paintings. Two months following discharge, the patient stated that he felt compelled to paint and had completed more than 140 paintings. He collected stones of all kinds obsessively, was still distracted and had difficulty expressing himself spontaneously. In order to demonstrate the cerebral blood flow changes in the conditions before and after treatment, we arranged 99mTc-Ethyl cysteinate dimer (Neurolite; Bristol-Myers-Squibb/ Dupont Pharmaceuticals Boston,MA) brain SPECT in two settings. Before the treatment, the only real objects that he painted were cows (Figure 1A) and he emphasized the sexual characteristics of the animals. His paintings at this period were abstract and used vivid colors (Figure 1B, C). In the abstract painting, there was use of symbolic label (Figure 1C left upper corner). The SPECT revealed hypoperfusion in anterior cingulate cortex (Figure 1D, arrow), bilateral medial frontal (Figure 1E) and anterior temporal regions (Figure 1F). Figure 1: Drawing of the patient prior to volproate and quitiapine treatment. Figure 1A represent the only realistic animal drawing with a photograph to refer. Most of the paintings were abstract and saturated in colors (B,C). Brain SPECT-ECD revealed hypoperfusion in bilateral anterior cingulate cortex (D, arrow), medial prefrontal (E) and anterior temporal lobes (F). After treatment, the style and types of pictures that the patient painted had changed. He now focused upon copying realistic pictures of furniture and animals (Figure 2A, B). He became less distracted by the environmental sounds and finishes one piece of work faster. He became less interested in using saturating colors. The colors were quieter now and not necessarily reflected the actual features of the object painted. He left the background blank on most of his paintings. The abstract component of his work was reduced to the production of a few strips of purple color (Figure 2C). Both the realistic and abstract works were less successful, lacking in complexity and composition. Based on the dramatic changes in the painting styles and behaviors, a followup SPECT was arranged at day eight. The hypoperfusion where previously demonstrated disappeared, including the anterior cingulate cortex (Figure 2D) and bilateral frontal cortex (Figure 2E) while the hypoperfusion of bilateral anterior temporal and cerebellum regions signals remained constant (Figure 2F). In addition, the signals of the temporal-parietal junction also became increased compared with the first scan. Figure 2: Changes in drawing styles after the treatment. 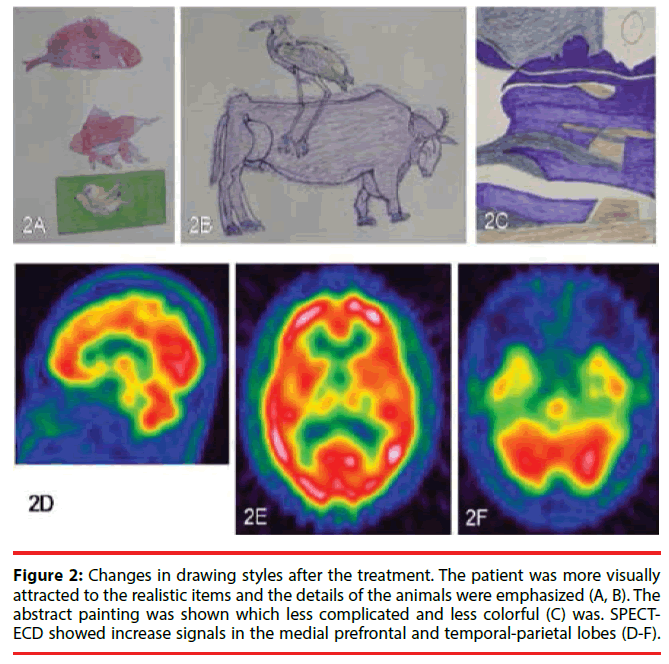 The patient was more visually attracted to the realistic items and the details of the animals were emphasized (A, B). The abstract painting was shown which less complicated and less colorful (C) was. SPECTECD showed increase signals in the medial prefrontal and temporal-parietal lobes (D-F). In this case report, we described the changing of painting pattern in a non-artistic patient with SD. Six months prior to assessment, he developed a new interest in song-writing and painting, both new activities. Following treatment, the song-writing activities ceased. Although he still produced the paintings, the new work was less abstract that lacked the visual complexity of his earlier works and he focused more on copying the realistic pictures. There are unique features associated with this patient. This patient combined both musical and visual artistic interests. Also, the abstract nature of his earlier paintings has not been described with SD. His paintings contained symbols and his copying of words onto the painting has not been observed in the Western literature. Yet, for this patient the copying of words may not have had a linguistic component. Rather, this phenomenon probably reflected a visual compulsiveness because for an illiterate man (like our patient), each Chinese character may be viewed as separate picture. Our SPECT scans offered interesting insights into the genesis and loss of visual or musical artistic abilities in our patient. At the time of his greatest visual creativity, signals in the medial-frontal cortex and anterior temporal regions were below normal. It had been proposed that a necessary prerequisite to a creative idea generation is a state of transient hypofrontality . Disinhibition related to orbitofrontal dysfunction  and the visual compulsiveness appear to be critical for the release of a free and visually exciting product. It enables the suppression of the analytical capacities of the explicit system and eliminates acquired social and personal constraints . Our SPECT result rehearsed this theory. After treatment, the patient was able to paint in a faster speed but the generation of melody and ideas of abstract paintings abolished remarkably with a regain of the follow-up signals in the medial-prefrontal regions and temporal-parietal region blood flows. It demonstrated that wellfunctioning of the frontal systems in directing and sustaining attention is also critical in art processing in the execution perspective. Increased artistic behavior has been described in association with SD in western patients [28-30]. One explanation for the emergence of artistic behavior after brain degenerations is the loss of regular language communication capacities. In common with the Western SD patients, this individual demonstrated technical precision and vivid use of colors. As the patient was diagnosed with SD, his sparing of visuospatial skills was an important factor in facilitating his realism and precision in copying the cows. The relative sparing of posterior parietal cortex in the second SPECT scan is powerful visual demonstration. The dopaminergic system D2 receptor may play an important role in releasing artistic talent in healthy individuals . A positive correlation between dopamine activities and creativity has been reported in bipolar disorder [32,33] or in patients with Parkinson’s disease treated with dopamine medicine . In our patient, use of quetiapine exerts biochemical blockades of dopamine D2 receptor and diminished his idea of generating abstract scene painting that may associate the link of dopamine activities in artistic behavior. The mechanism of dopamine augmentation or the psychopathology may not be as simple as a loss of cortical inhibitory control or an imbalance of neurotransmitters because not all patients with bipolar disorders, parkinsonian patients or dementia develop artistic behavior. The life-long dormant artistic talent may explain why only a small fraction of dementia patients exhibit artistic behavior. Of specific note, the presentation of delusion of grandiosity was not typical for SD and this patient may have a paranoid personality trait and an existence of life-long dormant artistic talent. Functional organization of medial frontal regions included the anterior cingulate cortex (ACC) and medial orbitofrontal region (Brodmann areas 24, 25, 32, 9 and 10) . The orbitofrontal cortex mediates information concerning the internal environment and the ACC facilitates the intentional selection of environmental stimuli based on their internal relevance [36,37], both are critical for novel ideas. Evidences have shown that interactions between the temporal lobes, frontal lobes, and limbic system had influenced on idea generation [38,39]. The medial orbitofrontal circuits  and ACC had strongest association with amygdala which was also related to affect processing. Diseases like SD with great atrophy in orbitofrontal, ACC and amygdala  may exert the influences on the compassion for abstract picture generations since these regions were specifically involved in idea generation. To conclude, the generalization of the current report is not possible based on particular combinations of culture, illetrism, medication and pathology. Artistic behavior and changes in painting styles in dementia patients required functional wiring of the frontal and temporalparietal regions. The influence of prefrontal lobe in artistic behavior can be considered in two folds. The well-functioning of frontal lobe is required so that temporal-parietal related goals as well as the abstract thinking, planning, theory of mind and goal-directed attention can be integrated for execution. Transient hypoperfusion in this area may impede the productivity of artwork but may elaborate pieces that are more abstract. The study was approved by Chang Gung Memorial Hospital’s Institutional Review Committee on Human Research (97-0255B). HHC participated in the design of the study, drafted the manuscript and performed the statistical analysis. QZW, PHL, SHH, SWH and NCC participated in the sequence alignment, clinical evaluation of patients and helped draft the manuscript. CCC helped draft the work and revise it critically for important intellectual content. All authors read and approved the final manuscript. Sternberg RJ, Lubart TI. The concept of creativity: Prospects and paradigms. Cambridge, Cambridge University Press(1999). Simonton DK. Creativity. Cognitive, personal, developmental, and social aspects. Am. Psychol55(1), 151-158(2000). Boone KB. The Boston Qualitative Scoring System for the Rey-Osterrieth Complex Figure. J. Clin. Exp. Neuropsychol 22(3), 430-434(2000). Miller ZA, Miller BL. Artistic creativity and dementia. Prog. Brain. Res204(1), 99-112 (2013). Kinsbourne M. Hemispheric specialization and the growth of human understanding. Am. Psychol37(4), 411-420 (1982). Martindale C. The biolofical basis of creativity. Cambridge, Cambridge University Press(1999). Buxbaum LJ, Kalenine S. Action knowledge, visuomotor activation, and embodiment in the two action systems.Ann. N Y Acad. Sci1191(1), 201-218(2010). Goldenberg G. Apraxia and the parietal lobes. Neuropsychologia 47(6), 1449-1459(2009). Osiurak F, Jarry C, Le Gall D, et al. Grasping the affordances, understanding the reasoning: toward a dialectical theory of human tool use. Psychol. Rev117(2), 517-540(2010). Osiurak F. What neuropsychology tells us about human tool use? The four constraints theory (4CT): mechanics, space, time, and effort. Neuropsychol. Rev24(2), 88-115 (2014). Heilman KM, Nadeau SE, Beversdorf DO, et al.Creative innovation: possible brain mechanisms.Neurocase 9(5), 369-379 (2003). Snyder AW, Mulcahy E, Taylor JL, et al.Savant-like skills exposed in normal people by suppressing the left fronto-temporal lobe.J. Integr. Neurosci2(2), 149-158 (2003). Limb CJ, Braun AR. Neural substrates of spontaneous musical performance: an FMRI study of jazz improvisation. PLoS One3(2), e1679 (2008). Frith U. Emanuel Miller lecture: confusions and controversies about Asperger syndrome.J. Child. Psychol. Psychiatry45(4), 672-686(2004). Sabbagh MA. Understanding orbitofrontal contributions to theory-of-mind reasoning: implications for autism. Brain. Cogn55(1), 209-219 (2004). Satpute AB, Lieberman MD. Integrating automatic and controlled processes into neurocognitive models of social cognition. Brain. Res1079(1), 86-97(2006). Roth JK, Serences JT, Courtney SM, et al.Neural system for controlling the contents of object working memory in humans. Cereb. Cortex16(11), 1595-1603 (2006). WuTQ, Miller ZA, Adhimoolam B, et al.Verbal creativity in semantic variant primary progressive aphasia. Neurocase 21(1), 73-78(2015). Gorno-Tempini ML, Hillis AE, Weintraub S, et al.Classification of primary progressive aphasia and its variants. Neurology 76(11), 1006-1014(2011). Folstein MF, Folstein SE,McHugh PR,et al. Mini-mental state. A practical method for grading the cognitive state of patients for the clinician.J. Psychiatr. Res12(3), 189-198 (1975). Kaplan EF, Goodglass H, Brookshire Donald L, et al.The Boston naming test. Philadelphia, Lea & Febiger (1983). Lin KN, Wang PN, Liu CY, et al.Cutoff scores of the cognitive abilities screening instrument, Chinese version in screening of dementia.Dement. Geriatr. Cogn. Disord14(4), 176-182(2002). Cummings JL, MegaM, Gray K,et al.The Neuropsychiatric Inventory: comprehensive assessment of psychopathology in dementia.Neurology 44(12), 2308-2314 (1994). Neary D, Snowden JS, Gustafson L, et al.Frontotemporal lobar degeneration: a consensus on clinical diagnostic criteria. Neurology 51(6), 1546-1554(1998). Dietrich A. Neurocognitive mechanisms underlying the experience of flow.Conscious. Cogn13(4), 746-761(2004). Tekin S, Cummings JL. Frontal-subcortical neuronal circuits and clinical neuropsychiatry: an update.J. Psychosom. Res 53(2), 647-654 (2002). Poole R. Kind of blue: creativity, mental disorder and jazz. Br. J. Psychiatry183(1), 193-194 (2003). Miller BL, Cummings J, Mishkin F, et al.Emergence of artistic talent in frontotemporal dementia.Neurology 51(4), 978-982 (1998). Miller BL, Boone K, Cummings JL,et al. Functional correlates of musical and visual ability in frontotemporal dementia. Br. J. Psychiatry176(1), 458-463 (2000). Mendez MF. Dementia as a window to the neurology of art. Med. Hypotheses63(1), 1-7(2004). de Manzano O, Cervenka S, Karabanov A, et al.Thinking outside a less intact box: thalamic dopamine D2 receptor densities are negatively related to psychometric creativity in healthy individuals.PLoS One5(5), e10670 (2010). Simeonova DI, Chang KD, Strong C, et al.Creativity in familial bipolar disorder. J. Psychiatr. Res 39(6), 623-631 (2005). Santosa CM, Strong CM, Nowakowska C, et al.Enhanced creativity in bipolar disorder patients: a controlled study. J. Affect. Disord 100(1-3), 31-39(2007). Schrag A, Trimble M. Poetic talent unmasked by treatment of Parkinson's disease. Mov. Disord16(6), 1175-1176 (2001). Amodio DM, Frith CD. Meeting of minds: the medial frontal cortex and social cognition.Nat. Rev. Neurosci 7(4), 268-277(2006). Bonelli RM, Cummings JL. Frontal-subcortical circuitry and behavior.Dialogues. Clin. Neurosci9(2), 141-151(2007). DeLong MR, Wichmann T. Circuits and circuit disorders of the basal ganglia. Arch. Neurol64(1), 20-24 (2007). Flaherty AW. Frontotemporal and dopaminergic control of idea generation and creative drive. J. Comp. Neurol493(1), 147-153(2005). Pollak TA, Mulvenna CM, Lythgoe MF, et al.De novo artistic behaviour following brain injury.Front. Neurol. Neurosci.22(1), 75-88(2007). Rosen HJ, Gorno-Tempini ML, Goldman WP, et al.Patterns of brain atrophy in frontotemporal dementia and semantic dementia. Neurology 58(2), 198-208 (2002).